We now offer Grand Rapids’ best selection of Premium African Coffees. Since opening our doors in 2007, Grand Rapids Coffee Roasters has proudly called Grand Rapids, Michigan our home. We are an independent wholesale micro-roaster committed to providing the freshest locally roasted coffee in West Michigan. All of our coffees are carefully hand-roasted in small batches for a smooth, never bitter, well-balanced cup like no other. 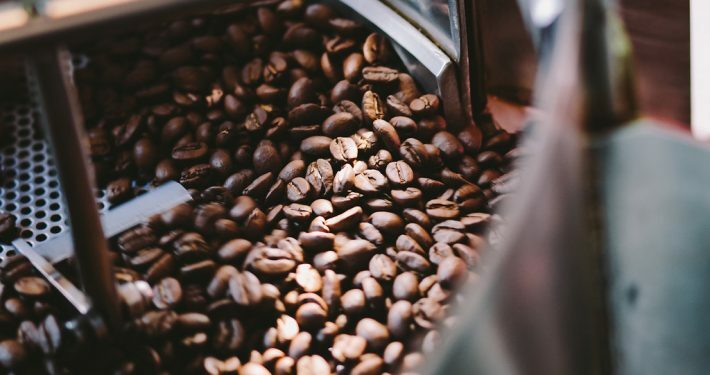 Over 30+ local businesses and hundreds of retail customers entrust in us to provide their custom roast-to-order coffee needs and we gladly deliver (quite literally, we offer next day delivery options for our wholesale customers and try to squeeze in frantic retail orders if possible). During the weekdays, we are hard at work roasting coffee for our wholesale accounts, tasting different coffees, and making deliveries. But on Saturdays, we open our shop to the public for a unique coffee educational experience called The Saturday Experience. Come see what all the boasting is about with the freshest local roast in town! 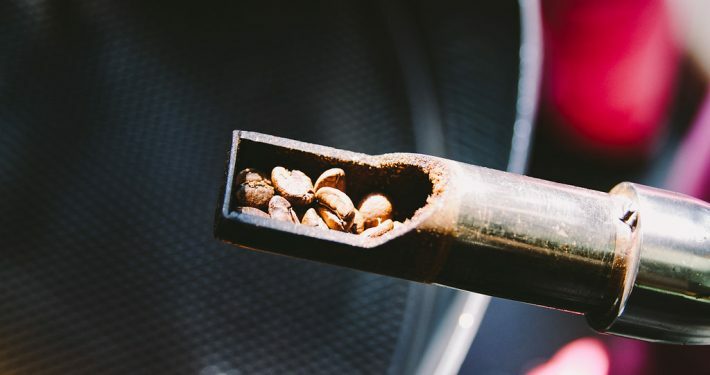 Trade Up To Better Tasting Coffee With Grand Rapids Coffee Roasters! With our unique coffee mug trade-in program, you can trade up to better tasting coffee! Bring in any competitor’s ceramic coffee mug and we’ll replace it with one of our colorful logo mugs featuring “Perky” the coffee bean. 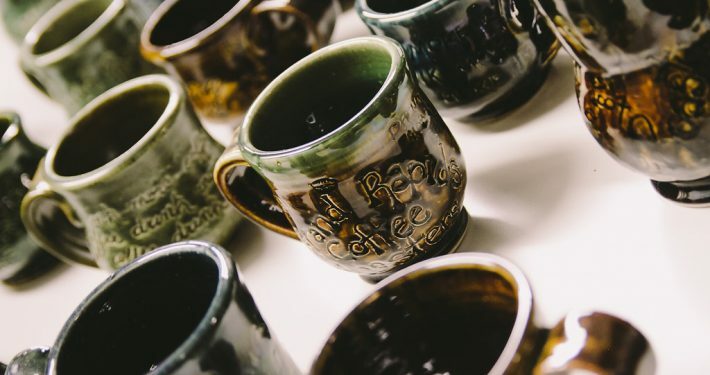 Your old mug will be hung upside down on display in the shop’s rafters on the “Coffee Mug Wall of Shame” alongside dozens of others. Only one trade-in coffee mug per customer please – while supplies last and/or until we run out of space! 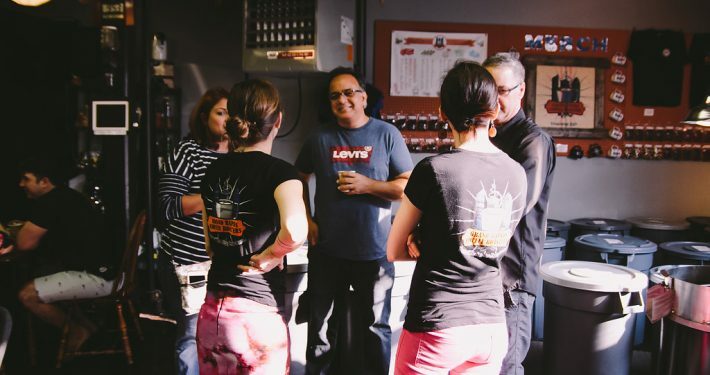 Grand Rapids Coffee Roasters’ Saturday Experience began as a way to give friends and family members an opportunity to sample our coffee while we received feedback to improve our roasting and blending skills. As we perfected the process, and more & more people came into our shop to see what we were doing, we decided to launch The Saturday Experience. Now we are open each Saturday to the public from 10:00am to 3:00pm excluding holidays and special events. We carry the best specialty grade Arabica beans from around the world. Many are certified Organic, Fair Trade, Rainforest Alliance and/or Bird Friendly. All of our specialty coffees are roasted-to-order! Explore our exotic variety of premium quality loose leaf teas. Luxurious tastes from around the world. Steep some culture! We carry a selection of fine candies, including chocolates, caramels, and chocolate-covered espresso beans. A premium cacao indulgence! This full-bodied herbal blend from South Africa brings to mind tropical flavors and white sand beaches. Contains freeze-dried blueberries and real sunflower petals. Blueberry Fields is a blend of fine Ceylon black tea with whole blueberries and flower petals. This uniquely sweet flavored tea is excellent iced! Our Earl Grey is a blend of fine Indian teas with twice the normal amount of the finest grade of oil of bergamot available. 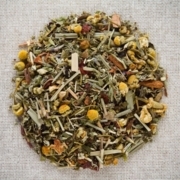 This relaxing herbal tea contains chamomile, rosehips, raspberry, papaya, peppermint, spearmint, strawberry leaf, vanilla, passion flower, red clover, star anise, and wild cherry bark. The Saturday Experience Is Fantastic! What a wonderful way to learn about where your coffee comes from and how it’s prepared. The staff is knowledgeable and friendly. It’s All A-Buzz On Saturday! Love this place when it’s all a-buzz on Saturday. We’ve become a big fan of their fresh roast coffee and use it all the time. Amazing fresh roasted coffee! Pure quality! These people know what they’re doing! It’s the real deal! My absolute favorite coffee shop in the world! Learn All About Coffee & Tea! Friendly staff, awesome coffees and teas, great place to have a sample, learn some things, and find your new favorite drink! Knowledgeable Staff – Great Coffee! This is absolutely the best place in town to get fresh roasted coffee. Come down Saturday’s between 10 and 3 for the “Saturday Experience”. Sit, talk and enjoy some free coffee. We stopped by on our art field trip to 1111 Godfrey last Friday. Thank you so much for your time and for sharing your incredible coffee knowledge! ️ I love the coffee I got. Thoroughly enjoyed our visit and learned a lot! Can’t wait to brew up some coffee. I’ve been an avid coffee drinker for at least 40 years. This is by far the best coffee ever. Anxious to try more of their roasts.